Apparently whenever director Brian De Palma and actor Al Pacino work together, they create flicks with lasting appeal that don’t do well during their original release. Such was the case with 1983’s Scarface. 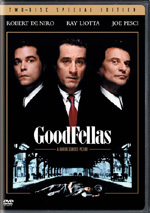 It failed to attract a great audience back then but gradually became seen as a gangster classic, a factor helped by the masses of rappers who adore it. 1993’s Carlito’s Way doesn’t enjoy the fame of Scarface, but it’s nonetheless managed to remain more popular than its initial lackluster theatrical one would make one believe. The flick pretty much tanked back then, and I don’t recall that it received many positive critical notices. However, it maintains a decent following – at least enough for Universal to bankroll a 2005 direct-to-video prequel and this new “Ultimate Edition” DVD. Way starts with its ending as it introduces us to Carlito Brigante (Pacino) right after someone shoots and seriously injures him. We then flash back and see events from 1975. 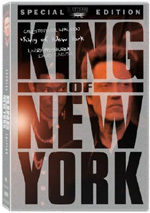 Carlito gets out of jail after five years of a 30-year sentence because his slick lawyer David Kleinfeld (Sean Penn) wins an appeal based on a technicality; DA Norwalk (James Rebhorn) used some shady tactics during the original investigation. A former big-shot criminal, Carlito claims he plans to go straight. He just wants to raise $75,000 so he can move to the Bahamas and invest in a buddy’s car rental agency. No one believes this claim, though, and they constantly try to re-involve Carlito in illicit activities. He resists but finds his past tough to avoid. Kleinfeld encourages Carlito to become the manager of his buddy Saso’s (Jorge Porcel) nightclub. After Carlito becomes unwittingly involved in a violent incident, he agrees and sees this as a way to raise his $75,000. This goes fairly well and even allows Carlito to re-encounter his old love, Gail (Penelope Ann Miller). He dumped her when he went to jail to protect himself, as he felt he’d worry too much about her if they stayed a couple. Carlito clearly wants to reignite that relationship, but since he broke her heart, Gail views matters warily. Carlito’s criminal past continues to haunt him, but an unusual source attempts to get him back into illegal activities. Kleinfeld stole a million bucks from gangster client Tony Taglialucci (Frank Minucci) and the crook’s not happy about this. To repay the debt, Tony insists that Kleinfeld help break him out of Ryker’s Island. Out of his league, Kleinfeld pesters Carlito to help, an idea the loyal Brigante grudgingly accepts. The rest of the movie follows Carlito’s relationships and attempts to reach his goals. That quote essentially sums up the plot to Way. Although this makes the movie follow a fairly predictable path, I don’t mind since it adds depth unusual for a gangster movie. Most of these go the Scarface route to look after the violent rise to power of those involved. Way takes the opposite road to look at someone who really does want to reform himself but finds it tough to avoid the mistakes of his past. Carlito does provide an unusually deep character for this kind of film. He still aspires to succeed and seems somewhat resigned to the fact that he’ll likely need to resort to some illegal methods along the way. However, he truly appears to aspire to get out of the scene; it’s not lip service, and his past weighs on him much more than expected. As the lead role, Pacino is a mixed bag, though usually good. On one hand, he shows too much of the bluster that mars many of his modern performances. This trend is exemplified by his work in Scent of a Woman, a turn notable for his loud “hoo-ah!” exclamations. There’s too much aggressive Scent of a Woman in Pacino’s performance and not enough of the subtlety that he brought out in earlier flicks like The Godfather. On the other hand, Pacino demonstrates a presence that serves the role well. For all his hamminess, there’s an authority and charisma Pacino emanates that help make Carlito much more believable than I otherwise might expect. When the actor backs off from his bluster, he seems eminently easy to accept in the role, as he really looks the part. Pacino also depicts Carlito’s weariness exceedingly well. Again, his non-verbal side works best. He conveys a lot with little looks and gestures. Despite his occasional bluster, Pacino manages to work fairly well in the lead part. While the plot elements that involve Gail become necessary in the end, they often feel somewhat artificial. For much of the movie, they come across as grafted on, and they don’t mesh well with the rest of the tale. By the end, they add up to a little more, but I still think they act more as plot devices than anything else. Carlito’s Way doesn’t serve as a great gangster movie, but it’s more than serviceable. It aspires to be something a little different, and despite some misfires, it usually succeeds. It works well as a nice change of pace. 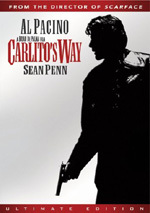 Carlito’s Way appears in an aspect ratio of approximately 2.35:1 on this double-sided, double-layered DVD; the image has been enhanced for 16X9 televisions. A few problems popped up but not much marred this generally positive transfer. The main concern came from light edge enhancement. I noticed mild haloes throughout the movie, and those occasionally rendered the image a little fuzzy. It usually stayed nicely crisp and concise, though. I saw no issues with jagged edges, but some shimmering occurred. I also detected sporadic examples of source flaws. These were limited to a few specks and a nick or two; nothing major defaced the presentation. With its Seventies setting and an emphasis on nightclubs, Way provided many opportunities for bright tones. The colors were the best aspect of the transfer. They consistently appeared lively and dynamic, and they remained firm throughout the movie. Even examples of red lighting held together well. Blacks also demonstrated deep, tight elements, and shadows were clear and easily visible. The edge enhancement and source flaws knocked this one down to a “B”, but it often looked much better than that grade might indicate. As for the audio of Carlito’s Way, it seemed more consistently mediocre. The DVD included Dolby Digital 5.1 and DTS 5.1 soundtracks. I detected no significant differences between the pair. Given the film’s genre and the era in which it was made, the soundfield maintained a surprisingly heavy emphasis on the front spectrum. Even during more action-oriented scenes with gunfire and other lively elements, the surrounds played a minor role. They fleshed out the front material in a modest way and that was it. At least the forward channels offered pretty good information. They showed nice stereo imaging for the score and created a solid sense of environment through effects. These were appropriately placed and usually meshed well, though a few transitions seemed a bit awkward. Audio quality was fine, though without great heft. Speech seemed concise and distinctive, and I noticed no signs of edginess. Music appeared reasonably lush and full, although I felt low-end was a little weak. The same thoughts greeted the effects, as they were acceptably accurate but without much bass response. This was a serviceable soundtrack. A few ads open the DVD. We get promos for Carlito’s Way: Rise to Power, Unleashed and Casino. All of the real supplements appear on Side Two of this disc. We start with Brian De Palma On Carlito’s Way. This five-minute and 26-second featurette offers the director’s comments on verisimilitude and various actors, visual elements, and movie critics. De Palma tosses out a few interesting comments but doesn’t tell us much of use in this quick piece. It flies by too quickly and without enough depth to stick. Nine Deleted Scenes last a total of eight minutes, 15 seconds. That running time doesn’t leave a lot of room for anything terribly substantial, so don’t expect a lot from these clips. They mostly flesh out existing scenes and fail to present anything terribly compelling. The disc’s most substantial supplements, The Making of Carlito’s Way runs 34 minutes and 34 seconds. It includes remarks from De Palma, author Edwin Torres, producer Martin Bregman, screenwriter David Koepp, and editor Bill Pankow. We learn about the origins of the story and its script development, bringing De Palma on board, Torres’ continued involvement in the project and inspirations for characters, the movie’s structure, working with the actors, dialogue and pacing, difficulties with/aspects of specific scenes, and the film’s reception. “Making” hits on all the necessary bases to become a useful program. It doesn’t try to reinvent the wheel, and that’s fine with me. It runs through the important aspects of the film’s creation with honesty and reasonable depth, so we get a good feel for the production here. It acts as a solid documentary. Inside the Photo and Poster Gallery, the elements break down into three smaller areas. “Portrait Gallery” includes 18 shots of the actors, while “Poster Gallery” presents 17 ads for the flick. “Brian De Palma” offers 35 photos of the director. The posters are easily the most interesting aspect of this collection. In addition to the film’s theatrical trailer, we get a five-minute and 13-second Original Promotional Featurette. This piece includes notes from De Palma, Bregman, Torres, and actors Penelope Ann Miller and Luis Guzman. The term “promotional” in the title is certainly accurate, as this piece exists solely to tout the movie. The comments simply tell us about the story, characters and participants with no insight into the production. Skip it. An unusual take on the gangster genre, Carlito’s Way mostly succeeds. It occasionally goes off-track with some weak plot threads, but it usually keeps us interested and involved. 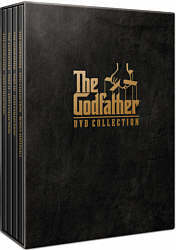 The DVD offers reasonably good picture and audio along with a decent set of extras. The flick merits at least a rental.